Illustrations by Eugene Yelchin from "Breaking Stalin's Nose"
There is a special category among novels that comprises books that are deeply touching and sad, yet universally and timelessly important, and so beautifully written that they can't be forgotten. "The Grapes of Wrath," by John Steinbeck, is the pinnacle of that small heap of novels. I read it once, crying at the ongoing tragedy of the Joad family, yet exulting at the overwhelming beauty of Steinbeck's prose. I want to read it again, but it will have to wait till I have more emotional reserves. It is a powerful book. "Breaking Stalin's Nose," a young-adults novel by my friend Eugene Yelchin, is in that group of excellent novels. It does not have the exquisite prose of Steinbeck at his best, but it is touching, beautiful and important nonetheless. Yelchin and I both worked at the Orange County Register in the 1980s. He was an illustrator, I was a writer, editor and designer. He may be the smartest and most talented person I've ever known. The Register was a pressure-cooker of creativity at that time, with an amazing staff that won every award possible to newspapers, and should have won more than it did. Yelchin was the most brilliant and fastest illustrator in a very impressive graphics department. No slow agonizing over ideas for him. Tell him what the story was about, he would produce an illustration that put it in your eyes almost as fast as his fingers could guide graphite and ink over paper. Since then he has worked as an illustrator, character designer and storyboard artist for movies, including "Rango," and TV shows such as "Cop Rock." He has done what he could to make his own movies, and has written and illustrated children's books. His nephew Anton Yelchin, by the way, is enjoying a pretty good career in Hollywood as an actor. 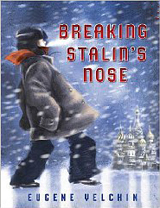 "Breaking Stalin's Nose" is the story of Sasha Zaichik, a young boy growing up in Stalin's Moscow. On the eve of joining the Young Soviet Pioneers -- his greatest wish -- he writes a letter to Stalin, saying how grateful he is to live in the U.S.S.R. He adds: "I have read how hard the lives of children are in the capitalist countries and I feel pity for all those who do not live in the USSR. They will never see their dreams come true." Sasha's dad is an officer in the State Security, and Sasha considers him a hero. Before his dad comes home from work, Sasha has dinner in the crowded kitchen -- "Forty-eight hardworking, honest Soviet citizens share the kitchen and single small toilet in our communal apartment" -- and is delighted when a neighbor gives him a treat -- a carrot. He takes small nibbles to make it last, and thinks, "I wonder what it's like in the capitalist countries. I wouldn't be surprised if children there never even tasted a carrot." When dad comes home, he sweeps Sasha up into his arms and carries the boy to their room. A large room they have to themselves, because Sasha's mother is dead, and dad is a hero. A neighbor, Stukachov follows. "'Don't talk to him,' says my dad. 'He'll use it.'" That night, other State Security officers come in the middle of the night and take dad away. Stukachov reported him for a crime that isn't named. As dad is taken away: "I grab his arm and hang on to him as tight as I can. This close, I see his ear is bleeding. 'It's more important to join the Pioneers than to have a father,' he whispers hurriedly. 'You hear me?'" Within minutes of dad being taken away, the neighbor Stukachov and his family have taken over Sasha's room, and Sasha has no place to stay in the frozen Moscow winter. He goes to Red Square. Surely Comrade Stalin will correct the matter once he learns that Sasha's dad, a hero, has been taken prisoner. Sasha is chased off by guards. He goes to his father's sister, but is chased away by her husband. The next day, he goes to school, hoping to be admitted to the Young Pioneers. The school doesn't know, yet, that his father has been arrested. Lots of drama and exposition at the school, where the teacher and most of the students strive to outdo each other as agents of Stalin's communist agenda. Children are ostracized and abused if their parents have been arrested. Most are ready to file a report on everyone else. Grim paranoia is the order of the day. Sasha faces, and makes, a life-changing choice at school. Eventually, Sasha goes to stand in line at Lubyanka, the state prison, where is father is being held (if he hasn't been shot yet). It will be a three-day wait. He is befriended by a woman waiting in line to see her son. She gives him a baked potato and learns he is homeless. "I tell you what, Sasha Zaichik. Now that my son's cot is empty, you're welcome to use it if you want." That is near the end of this touching little novel, which ends, as does "The Grapes of Wrath," with an act of compassion from a stranger, to save a life. Eugene Yelchin was raised after the fall of Stalin, but still experienced the fear of being dragged into an interview with an official from the Committee of State Security. He tells us, in an author's note, that he was afraid, and by the end of the interview felt insulted and humiliated, but wasn't harmed. If it had been in the time of Stalin, he knows, he would not have survived that interview. "But Stalin could not simply disappear; his legacy endured in the Russion people," Yelchin writes. "They had lived in fear for so long that fear had become an integral part of their very being. Unchecked, fear was passed on from generation to generation. It has been passed on to me, as well. "This book is my attempt to expose and confront that fear. Like my main character, I wanted to be a Young Pioneer. My family shared a communal apartment. My father was a devoted Communist. And like my main character, I, too, had to make a choice. My choice was about whether to leave the country of my birth." Eventually, Yelchin was able to get out of the U.S.S.R., which was difficult, and came to the United States, where he has a better life. His story in this book transcends time and place. As Yelchin wrote, "To this day, there are places in the world where innocent people face persecution and death for making a choice about that they believe to be right." It's a beautiful little book. Yelchin did his own illustrations.